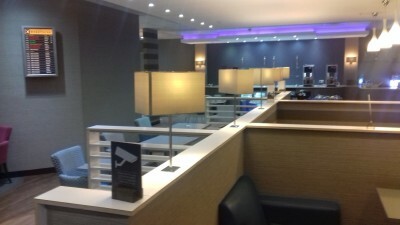 This is our review of Aspire lounge at Liverpool John Lennon Airport. 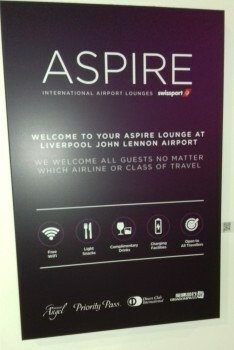 “The Aspire Lounge at Liverpool Airport is located inside the departure lounge after security on the lower level. You pass it on the way to all gates so it can’t be missed. 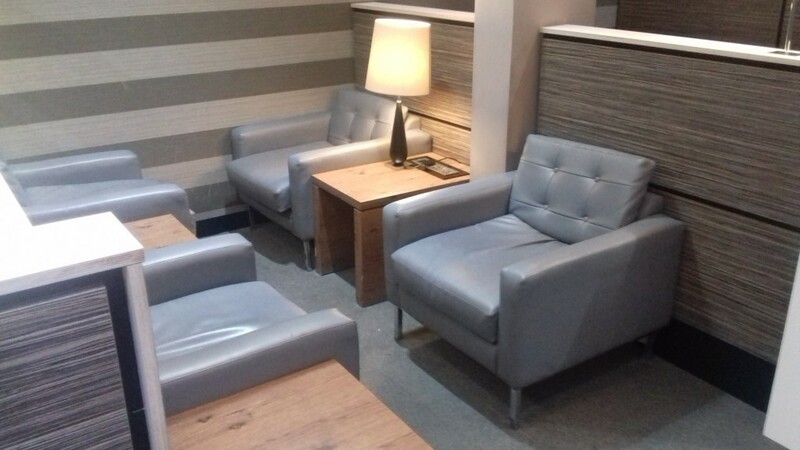 As you can see, is a modern facility with a wide range of seating – and not overcrowded at 7pm! Hot and cold snacks include cheese, crackers, soup, cookies, popcorn & crisps. 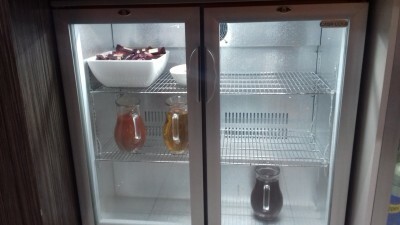 Drink options from the bar – which is not self service – include a selection of Fullers beers. I visited the Aspire Lounge at around 7pm – 1 hour before closing. 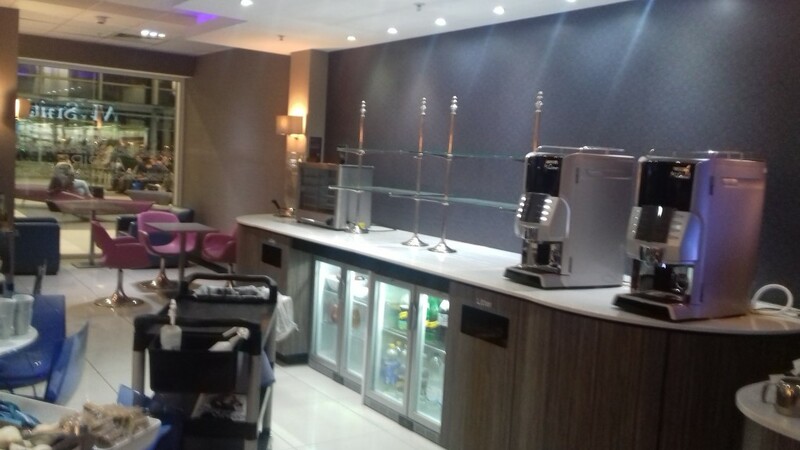 They had moved everything from above the fridges onto the tables …..
…… so that the cleaners could come in and do a clean from 8pm. Flight information screens display boarding information but no announcements are made. Newspapers and magazines are available at the reception. Thanks Bill. 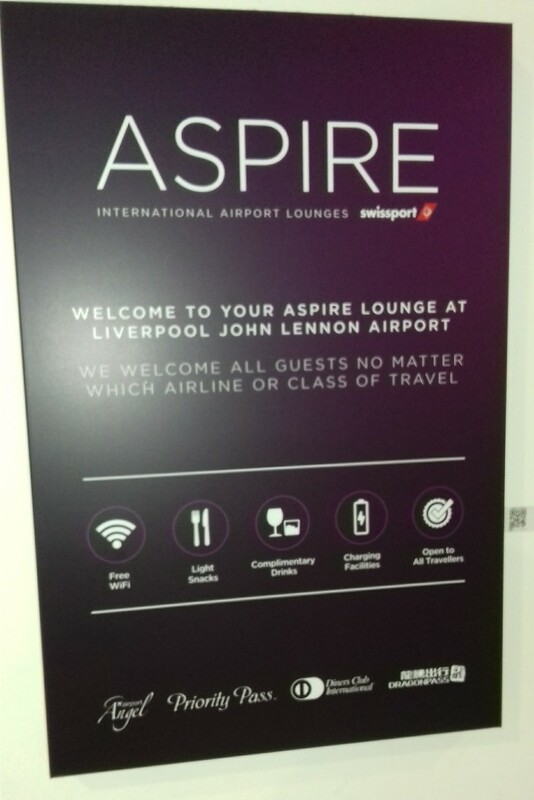 If you want to book a space in the Liverpool Airport Aspire lounge in advance, you can do it on the Aspire website here. Only been in the once, just the one staff member trying to cope with signing people in and serving at the bar ( tiny little area more suited to self serve) Most guests were bringing in cooked food from elsewhere. But what is the food/snack/drink selection like? I’ve been and it is mainly finger food. A few rolls, packets of crisps and the like. 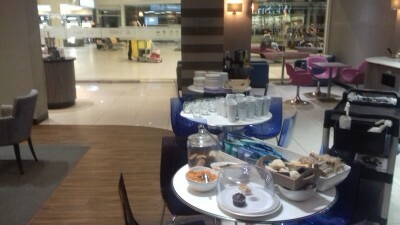 On a short flight you could eat here and not be hungry but it is not inspirational… It is a small lounge however and the staff were very friendly and helpful when I went. When I asked about gluten free food they had a decent selection of nibbles (better than most regional lounges) but nothing substantial. Forgot to say, alcoholic drinks cover the basics of beer, wine and a limited selection of spirirts. As mentioned in the main article it’s not self serve. There was no champagne that I remember being available, free or to buy. There are no toilets in the lounge either. I personally liked it however. Been here many a time. Staff always great. Presumably it was originally a shop, given location and size. They don’t seem to like accepting aspire stamp cards for entry, for some reason. Happily left me and my 3 year old there for 4 hours, without complaint, until it closed. Rob, is there a review coming up for the CWLCY gate lounge? I’m headed there later this year and wondered if it’s worth a visit or whether I should avail of the 20 minute checkin time? This review is not objective. I’ve been there 4 times, at 3 different times, in the last 4 months, and my experience is negative, sadly. -food and drinks (but very bare minimum: I had pasta there with three very different temperatures). -you can’t grab a can of a drink for a plane, especially if in rush, because drinks are served in large bottles. -the staff doesn’t seem to be proud of the languages they may speak, although sadly they are monolingual (English). I do like having an occasional conversation in German or Spanish, just because I don’t speak these languages as often as I’d like to. It’s just my little observation. If the staff isn’t monolingual, they could have language badges, perhaps. 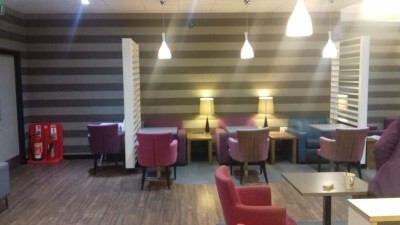 The lounge feels very sub-prime. Also, the food selection is usually very poor (usually empty stands/fridge; poor selection). I also asked about mocktails (cocktail-like drinks, except no alcohol in it), but all is served is just alcohol. I do sound very sub-prime to you. I might be indeed very sub-prime. So what? The lounge, however, should not be. I do not see any reason for you to publish this comment. Oh no, 5 minutes and 100 minutes. How ever did you cope! Doh, 100 metres, not minutes. But you get my point!! No, I don’t understand your point. I am just sharing my opinion, my experience, and compared to other lounges I visited, this one is not a good one. I specifically outlined why I think what I think. I took time to write this review, so please do respect the time I spent writing it, because it’s quite detailed, and I think it’s helpful for people with mobility difficulties.